I think that what most kids know about where chicken comes from is that somehow it appears in the store wrapped in plastic. I wonder what kids know about where Chestnuts come from. Do they form naturally in cans, jars, or plastic sleeves? Do they simply arrive at the grocer’s to be nicely arranged alongside walnuts, pecans, and pistachios? The answer, of course, is that chestnuts grow on trees, they are nuts in both the culinary and botanical sense. Technically, a nut is a fruit composed of a hard shell and a seed. Botanists also require that a nut be indehiscent, meaning that the shell does not open to release the seed. But, you correctly point out, Chestnuts are released from the burr. I can only observe that this business of botanical labeling is a bit of a lawyer’s game. While reading up on the definition of nut I discovered that many culinary nuts are actually seeds (such that Brazil nuts are seeds of a capsule while Walnuts, Pecans, and Almonds are seeds of drupes). 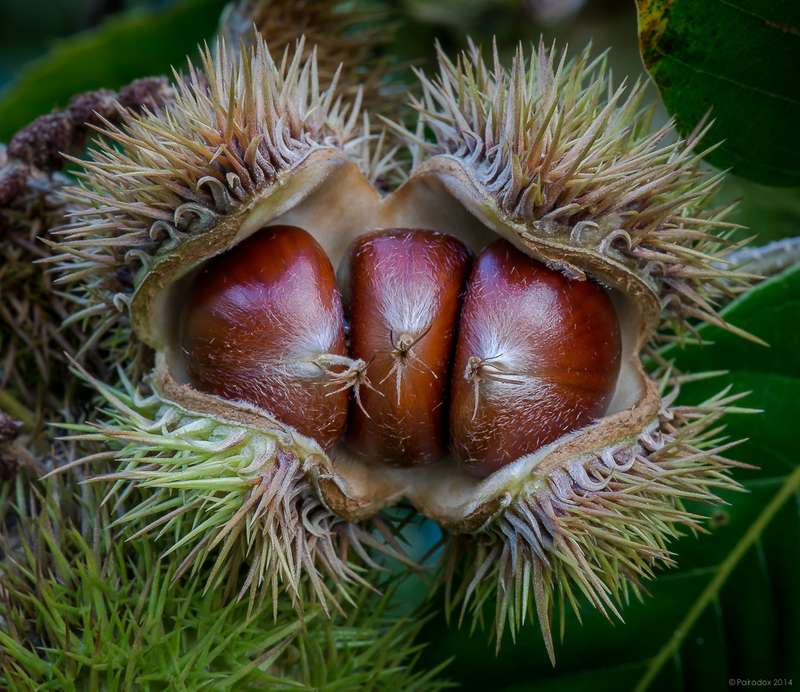 In any case, the photo below shows a burr of a Chinese Chestnut releasing its precious contents. You may know something of the history of the American Chestnut (Castanea dentata); it was all but eradicated from the eastern U.S. by chestnut blight (a fungus, Cryphonectria parasitica) which was accidentally introduced, from imported nursery stock, around 1900. By 1940 an estimated four billion trees had been lost. Resistant varieties of Chinese Chestnut (Castanea mollissima) were introduced and are now quite common. For nearly a century, scientists have applied the tenets of transmission genetics and of artificial selection to breed fungal resistance into stocks of remaining American Chestnut. You may check on the progress of the American Chestnut Restoration Project. By all accounts it has met with some success. The blight resistant American Chestnuts are currently two years old and have survived their first growing season after being moved into the forest. They are approximately four feet tall. Two of the blight resistant trees flowered in this first year, a significant measure of advanced maturity. They were examined in September 2009 and the survival rate is above 90 percent. The trees appear to be healthy. I wonder if any of you are asking Why should anyone care about a single tree species? Surely there are lots more out there. There are many answers to this question, I will offer three. The first is that the American Chestnut was here first and as such is entitled to exercise its privilege of squatter’s rights. It was not driven to the edge of extirpation by a natural infection, it was nearly lost due to the human importation of another species which harbored a deadly fungus. [Some would argue that humans are just as natural as fungi. I agree except for the little bits about ships capable of global navigation, the internal combustion engine and all the rest required to transport a pathogen across more than 5000 mile of open ocean from Asia to North America.] Through no fault of its own the endemic was attacked as a direct result of human activity. The second reason I can think of relates to the dynamics of ecosystems. I believe that we humans like to think that we know quite a bit about how ecosystems work and how they respond to perturbation. Although the science of Ecology has been recognized for more than a century, I do not believe that scientists, even those with supercomputers and algorithms, have come close to knowing how ecosystems respond when disrupted. This must be so because the lifetime of an ecosystem must be measured in thousands or even hundreds of thousands of years. What can we hope to learn about the response of an ecosystem over a span of even a century? Given the uncountable and unknowable number of organisms that were dependent upon the American Chestnut, its loss must have been, is still, and will continue to be significant in ways that we cannot know or measure. Rather than wait to learn of the consequences of its loss, I suggest we would be better advised to do what is required in support of its restoration. And, finally, I think it’s important to bring the American Chestnut back for the sake of authenticity. To simply supplant one species with another is not the answer because this does not restore the forest to its original state. S. J. Gould, when writing about the various guises of authenticity, wrote … The real and the replica are effectively alike in all but our abstract knowledge of authen­ticity, yet we feel awe in the presence of bone once truly clothed in dinosaur flesh and mere interest in fiberglass of identical appearance. So, yes, lots of us Tree Hugger Environmentalists worry about losing even a single species, for the loss lessens the authentic nature of our environment. A woodland landscape populated with a suitable replacement would be a lesser woodland indeed.